Increases Focus And Energy To Help You Crush Even Your Toughest Workouts! 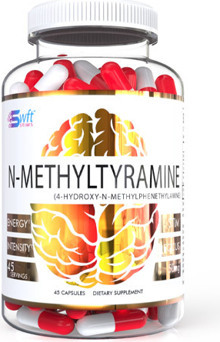 SWFT N-METHYLTYRAMINE is a methylated version of Tyramine and a potent B2 adrenergic receptor agonist. This B2 activity is associated with an increase in plasma and myocardial cGMP and aAMP levels which translates to an increase in metabolism and oxidation of fatty acids. NMT is also a mild A2 adrenoreceptor antagonist. A2 blockers may significantly increase adrenergic, dopaminergic and serotonergic transmitters. NMT is a focus and energy product to help you crush even your toughest workouts. It gets your mind and body in sync and ramped up with intensity. It can be taken as a standalone or stacked with other SWFT stim products. But use it by itself before venturing into stacking to assess your tolerance. 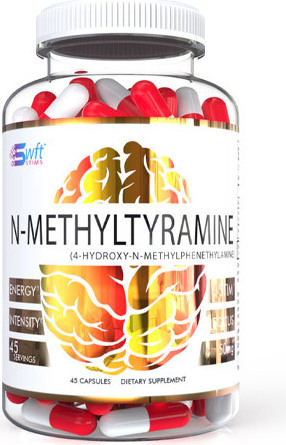 N-Methyltyramine can also be used as a fat burner or in conjunction with a fat burning stack such as with Higenamine. Boost your fat burning potential while you work out by adding in NMT. WHEN SHOULD I TAKE NMT? NMT is highly versatile. It can be used as a boost to kick start your morning or to accelerate your workout. Whenever you are looking for energy, NMT is here.